An innovative agreement between Indigenous communities, energy companies and federal and provincial governments is expected to conserve more than 166,000 hectares of boreal forest. 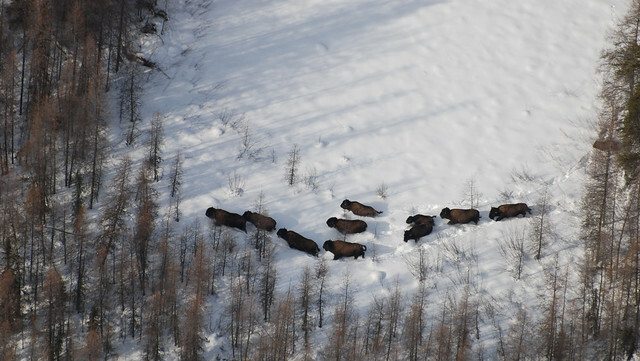 Bison roam in the proposed Biodiversity Stewardship Area south of Wood Buffalo National Park. The proposed Biodiversity Stewardship Area (BSA) would be designated a wildland provincial park. This would conserve natural landscapes and watersheds just south of Wood Buffalo National Park, protecting habitat for caribou, the Ronald Lake bison herd and other wildlife. The idea of a unique Biodiversity Stewardship Area was proposed by Mikisew Cree First Nation to safeguard their way of life while addressing concerns raised in a 2016 UNESCO report on Wood Buffalo National Park. The concept has also received strong support from Athabasca Chipewyan First Nation, Fort McKay First Nation, Fort Chipewyan Metis, Fort McKay Metis, Fort McMurray Metis and the Athabasca Tribal Council. Discussions brought a consortium of industry stakeholders to the table with Indigenous peoples and the governments of Alberta and Canada. The province will now begin a 30-day consultation to protect the BSA by designating it a wildland provincial park. Industry champions Teck, Cenovus Energy and Imperial played a vital role in discussions by agreeing to a voluntary relinquishment of oilsands and mining leases. The BSA will add an area that is bigger than the combined footprints of Calgary (825 sq. km), Red Deer (69 sq. km), Edmonton (684 sq. km) and Fort McMurray (60 sq. km). The new BSA will add to the more than 6.7 million hectares of contiguous boreal forest protected earlier this year through an agreement with oilsands producers, First Nations, the Nature Conservancy of Canada and provincial and federal governments.